The third time is the charm? The newest addition to Samsung's successful Galaxy Note series comes with a huge 5.7-inch display - fitting, given the current trend toward ever-larger smartphone screen sizes. But is this beast truly a sight to behold or is it actually a step in the wrong direction? Unsuprisingly, the Galaxy Note 4 is a better phablet than its predecessor in every regard. It has a nicer build, an incredible display, a faster processor, revamped interface and enhanced functionality, along with a better camera, and a slightly longer battery life. If you are a fan of big-screen phones, and the Galaxy Note line in particular, there's hardly anything unlikeable about the fourth-generation Galaxy Note. The Samsung Galaxy Note 4 is set to be the biggest smartphone (or phablet) launch of the year. With significantly faster hardware and a fantastic Quad HD screen, you won't need us to help you decide whether you should buy the Note 3 or Note 4. We just can't wait to get this one into our lab. It's a big handset that certainly won't be suitable for everyone, but it has already come down in price since it launched. It is currently available SIM-free for £549 direct from Samsung. On contract you can get the handset free from Vodafone on a two year, £35.50 per month contract with unlimted minutes, unlimited texts and 4GB of 4G data. If you can stump up that much cash per month for the full length of a 24-month contract then this is an outstanding slice of technology. There's not much choice when it comes to such giant phones, but when the Samsung Galaxy Note 3 is this good, that's not really a problem. Winning five rounds to the Galaxy Note 3's two, the LG G3 is the overall winner. Featuring a more intelligent design, crisper screen and significantly better camera, the LG G3 is one of the finest Android smartphones currently available. However, with the Samsung Galaxy Note 3 over halfway through its product lifecycle this really isn't all that surprising. LG's real competition is yet to arrive and things could well change with the launch of Samsung's fabled 2014 phablet, the Galaxy Note 4. Having won four rounds to the Galaxy Note 3's two rounds the Galaxy S5 is the winner of our head to head review. Featuring a more ergonomic, water and dust resistant design, more robust portfolio of security services and significantly better rear camera than its phablet predecessor, the Galaxy S5 is currently the best Samsung handset available. However, featuring a larger, but equally impressive screen, slightly better battery and useful S Pen Stylus, there is still plenty to like about the Galaxy Note 3. If Samsung had got its act together and updated the phablet to the current KitKat version of Android and new version of Touchwiz, the battle would have been far, far closer. After several weeks with a Galaxy Note 3 in hand, it’s clear that it is the best large-screened, stylus-supporting smartphone you can get. The S-Pen is the perfect companion tool for annotations on the fly, with some seriously impressive software enhancements – especially S Note and Action Memo. Performance from the Galaxy Note 3 is fantastic, and this time both the Exynos and Snapdragon models are up to scratch. There’s still no HMP support for the octa-core Exynos, but the lag is gone and performance is largely on-par with the Qualcomm model. I’d still be wanting Snapdragon-only features such as LTE and 4K video recording in my Note, but the Exynos model is still a solid choice. There are a lot of large smartphones on the market, but none takes advantage of its sprawling display the way the Samsung Galaxy Note 3 does. Between the built-in stylus and all of the apps it can be used with, the Note 3 is the most versatile phablet around. We just wish it were able to take advantage of Sprint's Spark network. For Rs 45,000, the Note 3 offers an excellent screen with solid multimedia performance. The stylus implementation is nicely done. So in short, if you're fine lugging around a big phone that requires both hands to operate, go ahead and buy the Note 3. It's one of the most powerful, oversized handset you can currently get in India. On the other hand, considering the phone's 45k price, the phone's interface doesn't feel premium. In fact, it feels cluttered at many places. The design is another aspect where Samsung needs to work on. So if you're not overly finicky about the specs, the LG Optimus G pro is a very good alternative. Priced under 30,000, it's a good Rs 15,000 cheaper too. The Note 3 is an excellent evolution of the series and is by far our favourite large-screen phone. It is powerful, long lasting and has some noticeable improvements over the previous Notes. Ultimately its suitability will come down to whether or not the form factor is suitable for your needs – we know enough people in the pro- and anti-Phablet camps to try and make that decision for you. But if you want a larger screen than standard, and are prepared for the compromises that feature brings, the Note 3 is far and away the best option. Yet another truly excellent piece of hardware from Samsung. In the end, what’s left to say for Note 3 and gear? First of all, this general increase in number of everyday devices that are transformed into smart devices is becoming a trend, which is not a bad thing at all. Second of all, Note 3 isn’t much of an upgrade for Note 2 owners and it just isn’t worth the investment. Note 3, as an upgrade from a smaller model is an ideal solution. If you haven't got the idea by now, the Galaxy Note 3 is a nice device. It's not without its flaws of course, and the way that Samsung sets things up on it is a little weird, but overall it's a solid product. One thing that I love and yet the default setting bugs me is the S Pen Keeper. You can find the Samsung Galaxy Note 3 retailing online for about Rs 47,000, which is still a very high price for what’s on offer. Granted, the phone is packed to the gills with the latest hardware and specs but it lacks that premium look and feel. Faux chrome and leather is not something you want to see when you’re shelling out more than Rs 40,000. And then there’s all that plastic, which doesn’t really help its case. Samsung’s TouchWiz can get freaky at times too as we experienced random slow-downs and moments where the phone would just switch off when the display is off. However, nothing beats the Note 3 when it comes to battery life and stylus input as it's still among the best in the biz. I’m not sure if the falling rupee value is to blame entirely but all flagship smartphones seem incredibly overpriced and they really need to come down a notch or two, especially the droids. If you own a Note 2, then the Note 3 won’t really feel like much of an upgrade apart from the fact that it’s slimmer, lighter and has a slightly better camera. The Note 3 is one of the best Android devices on the market. The S-Pen is more useful than ever, Qualcomm’s Snapdragon 800 processor shows just how good it is – everything rockets along fiercely, even the CPU-intensive multi-window. Battery life is phenomenal and TouchWiz is one of the most useful Android overlays around. In some ways (not least of which is that we’ve not got our hands on the 1520) it’s too early to give concrete buying advice. However, on the other hand, the fact that the Note 3 runs Android is a big advantage over the Lumia 1520 which runs Windows Phone 8. Both phablets have good cameras, but each has different strengths and weaknesses. With very similar processors, neither will disappoint when it comes to performance. We’ll update this review once we’ve fully tested out the Lumia 1520. Put simply, the Samsung Galaxy Note 3 is the best phablet in the world right now. Its glorious 5.7in screen pumps out crisp detail and punchy colours while still remaining pretty portable, at least compared to the gargantuan 6.4in Sony Xperia Z Ultra. Not everyone will be, and for those people there are more fantastic flagship phones available than ever before, as just a glance at our Top 10 list of the best smartphones in the world will attest. But for those who want to replace the phone and tablet with one do-it-all device there is a new champion – the Samsung Galaxy Note 3. The Galaxy Note 3 has excellent performance in a 5.7” form factor, making it the perfect device to perform the tasks you would do on a smartphone or a tablet (reading books or watching videos), effectively nullifying the need to buy both devices. “Phablets” have become more common nowadays, and we have seen our share of them, like the 6.4-inch Sony Xperia Z Ultra, the 6-inch Acer Liquid S2 or the 6.3-inch Samsung Galaxy Mega. While the Note 3 did put up some of the best numbers we’ve seen from any smartphone we’ve tested to date, in real-world use, it was also noticeably faster and more fluid than many other devices we’ve used. The speedy Snapdragon 800 SoC with Adreno 330 graphics, relatively fast internal storage, 3GB of system memory and Android 4.3 team up to produce an experience that’s currently among the best in the Android-based smartphone market. Having won four of our six categories, Samsung's retained its crown as king of the big screen smartphone makers. The Galaxy Note 3 has a better screen and processor and is far more comfortable to use than the HTC One Max. However, the Max does have some good qualities, featuring a better Ultrapixel camera and custom software that makes it far more pleasant to use as a media consumption tool. That, coupled with the sheer size of the Samsung Galaxy Note 3, is just enough to knock it out of contention for our top A-List spot. But if you can live with its pocket-bulging dimensions, the slick performance, superb battery life and great camera – coupled with the huge screen and stylus – make it a hugely appealing handset. With its nearly 10 hours of battery life, big and bright screen, sharp camera and powerful software, the Galaxy Note 3 is the ultimate high-end smartphone. Consumers looking for a smaller device on Verizon should consider the 5-inch Galaxy S4, 4.7-inch HTC One or the 4-inch iPhone 5s. Those looking for lower rates should consider T-Mobile or Sprint, which have smaller LTE footprints but charge a lot less per month. Impressive though it undoubtedly is, the new Note 3 doesn't eclipse the Sony Xperia Z Ultra. The Ultra’s screen is larger and more natural in hue; Sony’s tweaked version of Android is a darned sight less confusing than Samsung’s; the bespoke Sony media apps are better if only by a small margin; and the battery life seemed better. And of course it’s waterproof. This is the first phone to work with the Samsung Galaxy Gear smart watch. It’s a good combination. With a screen this size you may well find yourself in situations where you want to keep the Note 3 in your pocket or bag, in which case being able to read the first line of a text or email on your wrist is easier, not to mention making a call on it. If you are in the market to pick up a large screen smartphone (larger than 5.5-inches) with some impressive specifications and a lot of preloaded apps and features, the Galaxy Note 3 is a very good pick, especially if you're enamoured by the apps and potential of the S-Pen. However, if all you're looking for is a large display, then we would advise you pick up the Sony Xperia Z Ultra. The LG Optimus G Pro is another alternative worth considering, if the above two don't entice you. Both the G Pro and the Z Ultra pack some impressive hardware with the Z Ultra boasting of weather-proof capabilities as well. The Galaxy Note 3 is Samsung's lightest and thinnest Note device yet. It's also the fastest, with applications firing up instantly in almost every situation. We found that operations ran fluidly and the device works effortlessly, making it a pleasure to use. The Galaxy Note 3 is the fastest smartphone we've used, so those looking to multitask and juggle heavy workloads are likely to really value it. The Samsung Galaxy Note 3 is a great phone and if you were to own one you wouldn't be disappointed. It provides a great onscreen experience - as long as your hands are big enough to reach across it - and its stuffed full of tech to almost warrant its lofty price tag. This is the best Galaxy Note smartphone to date and if you're a fan of the range then you'll love the Note 3 - but if you're looking for the best smartphone in the world you'll need to look elsewhere. The Galaxy Note 3 is a high-quality portable device, offering the best performance we've ever seen, a stunning screen and nice build quality. We award four and a half stars. See also: Sony Xperia Z1 vs Samsung Galaxy Note 3 smartphone comparison review - which is the best Android phone? However, you’ll have to contend with the extra applications and features that the company bundled with the Note 3. You must manually turn off features like Smart scroll when they’re not in use if you want to preserve battery life (and, possibly, your sanity), and you must ignore the fact that Samsung’s less-superior S-Voice is the default personal digital assistant. In exchange, you’ll have a powerhouse phone designed for multitaskers, with a quad-core processor, forward-thinking video-recording abilities, and battery life sufficient to get you through long, ardous days. In essence, that’s really what we’ve come to expect from our phones in this day and age, even if they don’t quite fit in our back pocket. The Samsung Galaxy Note 3 is far and away the most mature smartphone of this size on the market today. More than that, Samsung has outdone themselves in this category – with the likes of Air Command, the S Pen suite becomes a solid experience that I’ll no longer have to explain to relatives is just for writing notes and drawing pictures. Here there’s a real solid draw. Have a peek at the timeline below for additional Galaxy Note 3 bits and pieces and don’t hesitate to continue asking us questions about this device well into the future! The real question with a Samsung Galaxy Note 3 is whether you think it’s more convenient to carry a phone or tablet or a combination of the two. As tablet/phone hybrids go, the Samsung Galaxy note 3 is hard to beat. The screen is gorgeous, the processor means it’s mighty fast and the camera is excellent – especially the 4K video recording. Battery life is more than decent and the features offered by the S pen stylus are neat. And the handwriting recognition is good. 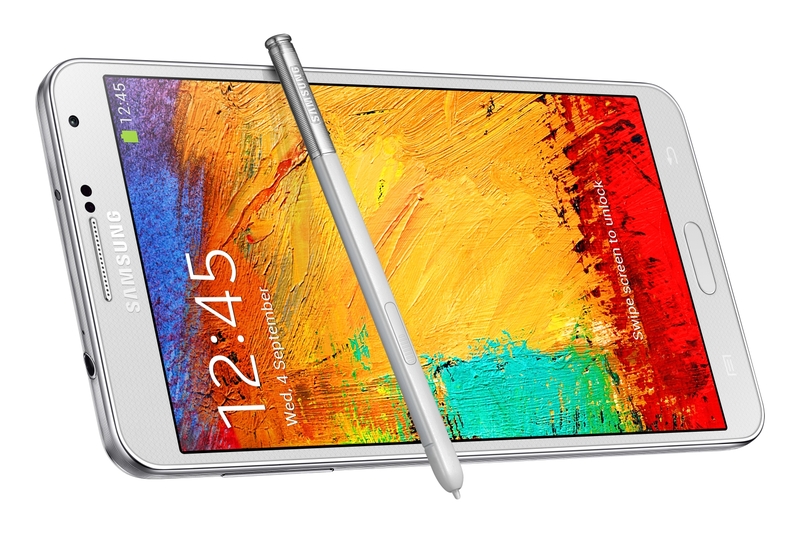 If you like a big screen, the Samsung Galaxy Note 3 is worth a look – it’s the best phablet yet. The Galaxy Note 3's all-day battery life would be reason enough to recommend this phone. However, when you also consider its best-in-class screen, sharp camera, powerful software and pen-enabled apps, it's hard to not to want this Android phablet. Users who desire a smaller or less expensive handset may opt for the Galaxy S4 or HTC One, both of which cost $100 less on T-Mobile. To use a term of phrase borrowed from that other mobile giant, this is Samsung's best Note yet. It's better in pretty much every way, with the possible exception of that speaker. The display is bigger, but it never makes the device feel inflated, which is some sort of dark magic in its own right. Not everyone will be, and for those people there are more fantastic flagship phones available than ever before, as just a glance at our Top 10 list of the best smartphones in the world will attest. But for those who want to replace the phone and tablet with one do-it-all device there is a new champion – the Samsung Galaxy Note 3. Sony Xperia Z1 vs Samsung Galaxy Note 3 smartphone comparison review - which is the best Android phone? It's a close run thing, and we'd recommend you handle both of these handsets before you buy. The Note 3 is the better performer, but we're talking about a level of performance on both phones which is more than adequate for everything you need to do. It has a bigger, more colourful screen - but not everyone wants a huge screen and the Xperia Z1 has a sharper display anyway. Camera wise we'd err toward the Z1, but neither is earth-shatteringly good. And battery life is about even, albeit with the Z1 again marginally on top. They run similar software similarly well, and although only the Z1 is waterproof, they are both built to last. You pays your money you takes your chance. Two great phones that show how far Android has come. The Galaxy Note 3 is very much an evolution, with the specs starting to top out. The 3GB of RAM, the 13MP camera and octa-core processor are all nice additions, as well as things like superfast 4G on board. It's excellent sonically, can display superbly crisp images, and has a number of tweaks to the camera that mean it can take decent snaps. Those are the things we want to judge the Note 3 on, not the ability to click the S Pen in a different manner. We're not sold on the design of the back, nor the high price - but there still seems to be an appetite for the Note range, so perhaps this is just the handset Samsung needs. The Note 3 has mind-boggling amounts of grunt under the hood – it features Samsung's Octa Core processor, clocked at 1.9GHz (fractionally faster than that of the Samsung Galaxy S4). However, that's restricted to the 3G model – the LTE version will feature a 2.3GHZ quad-core processor. The Galaxy Note 3 is very much an evolution, with the specs starting to top out. The 3GB of RAM, the 13MP camera and octa-core processor are all nice additions, as well as things like superfast 4G on board. We're not sold on the design of the back, nor the high price - but there still seems to be an appetite for the Note range, so perhaps this is just the handset Samsung needs. Positive: 13-megapixel camera with Xenon flash. Ah, the phablet. It won't fit in the pocket of skinny jeans, and it gives hands a workout because of its size. Fans of the Galaxy Note 2 should note that the screen has grown from 5.5 inches to 5.7 inches, and is now an impressive 1080 x 1920 Super AMOLED display. Like most Samsung offerings, it is solidly built and even good looking with its metal frame on the sides. The back is plastic that is textured to look like leather, complete with faux stitches. At a quick glance, this looks pretty good, but it really is quite tacky looking if you're paying attention. Still, it is the best looking of the Note line. Samsung have managed to make the Note 3 slightly smaller than the Note 2 overall, and lighter too despite larger screen, more performance and better specs. Under the hood is the 2.3 GHz Snapdragon 800 quad-core processor and 3 GB of RAM. Multitasking poses no problems which can be expected since the Samsung Galaxy Note 3 features the best specs among Android phones at the moment. Samsung has significantly improved the S Pen functionality with the Air Command controller. Triggered when the user slides out the S Pen, it allows one to launch great S Pen friendly apps with a single tap. Battery life is great and it will easily last more than a day of heavy use. Overall, this is a great device, and easily recommended as long as the size of this phablet is acceptable to the user. 89.08%: There do not exist many models, which are rated better. The most ratings get ratings, which are a bit worse.